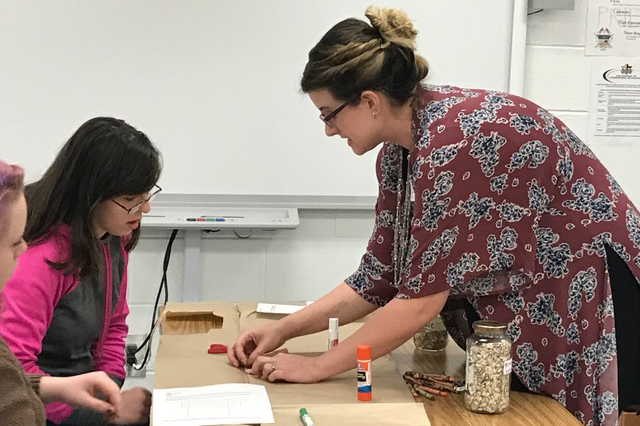 Katie Hilton (right), who is majoring in middle grades education, helps a Fannin County High School student make a seed packet for heirloom sunflowers. 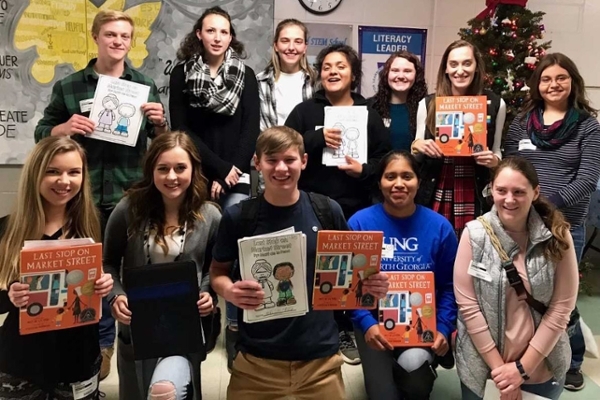 The University of North Georgia's (UNG) Blue Ridge Campus and the Appalachian Studies Center in Dahlonega have partnered for the second year with Fannin County High School to bring programs and speakers focused on outdoor learning to high school students. "This is one way we celebrate and perpetuate the mountain area's vibrant culture," said Sandy Ott, director of UNG's Blue Ridge Campus. The first program, "Planting By the Signs: Appalachian Gardening Traditions," featured arts-based research of UNG students in the Appalachian studies minor as well as stories by Keith Jones, a master storyteller whose family have lived in the area for generations. "As students collected associated ethno-cultural memories related to heirloom seed-saving, UNG students noticed many of them talked about 'planting by the signs,' a tradition of using an almanac to plant according to the phase and position of the moon," said Rosann Kent, director of UNG's Appalachian Studies Center. "From follow up conversations and archival research at The Foxfire Museum and Heritage Center in Rabun County, students wrote a script and created a 'crankie,' a scrolling panoramic theater of delicate paper cuts." The crankie presentation and storytelling was followed by an "Heirloom Seed Buffet" so audience members could help themselves to seeds grown by Appalachian studies students. The second event, Heirloom Seed Day at Fannin County High School, originated when Lynn Burch, family and consumer science educator at Fannin County High School, contacted Ott for recommendations on programming related to a proposed outdoor learning center. This project is part of the development of a Legacy Learning Lab at the high school. "Family and consumer science students in our high school have applied for a grant which would enable an outdoor classroom and garden to be built. One of the key components would be heirloom seeds and herbs," Burch said. "Students would grow vegetables and herbs to be incorporated into their weekly culinary labs. Extra produce would be donated to the local food band or Feed Fannin. The goal of the outdoor classroom and garden is for students to become better connected with healthy eating habits, focusing on consuming additional fresh vegetable and herbs, and to create a garden-to-table food chain with student ownership." 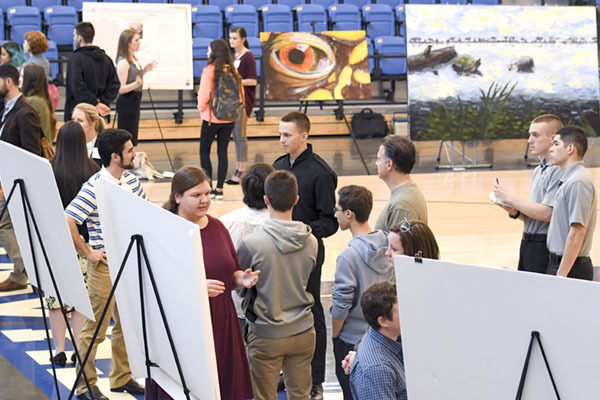 Students from UNG's College of Education planned four activities related to seed-saving, and taught 240 high school students in one day through hands-on demonstrations. 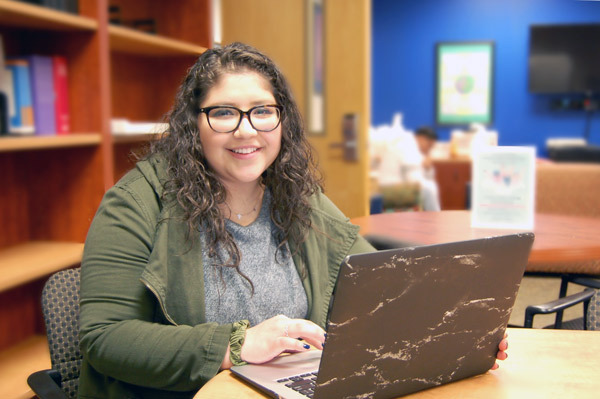 "We are so grateful for the UNG Blue Ridge Campus and the opportunity for post-secondary education for our students," Burch said. The Appalachian Studies Center, provides invaluable connections between UNG and its regional partners to support education, economic development, cultural preservation, and workforce readiness. For more information, visit the center's website at https://ung.edu/appalachian-studies-center/.